The eyelids are thin, mobile folds that cover the eyeball anteriorly. They offer protection from excessive light or injury, and maintain lubrication by distributing tears over the surface of the eyeball. The eyelids are split into upper and lower portions, which meet at the medial and lateral canthi of the eye. The opening between the two eyelids is called the palpebral aperture or opening. In this article, we shall look at the anatomy of the eyelids – their layers, vasculature and innervation. 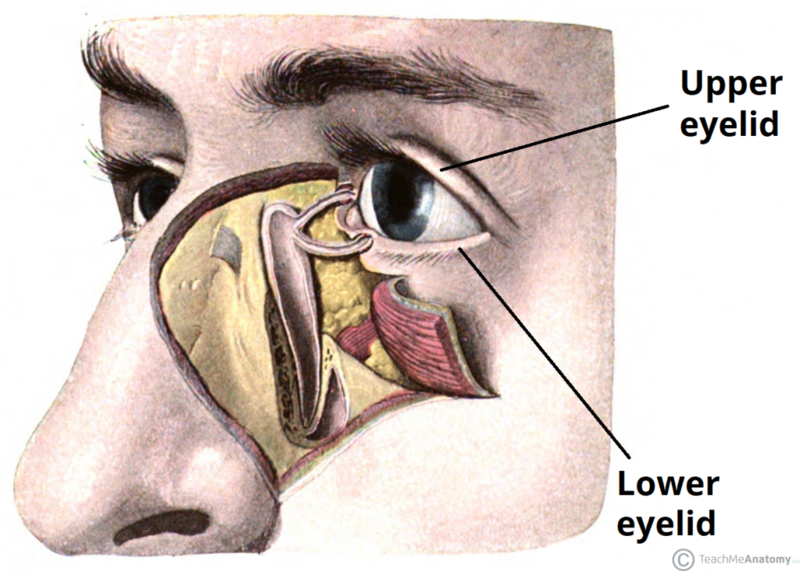 Fig 1 – The upper and lower eyelid. The skin and subcutaneous tissue form the most superficial layer of the eyelid. 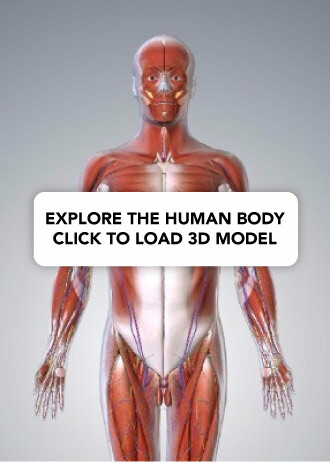 The layer of skin is among the thinnest in the human body. In the subcutaneous layer, there is loose connective tissue but no subcutaneous fat – and subsequently, the eyelids are readily distended by oedema or blood. The eyelashes are attached here with their accompanying modified sweat glands – the ciliary glands of Moll. There are also sebaceous glands located in this layer, known as the glands of Zeis. 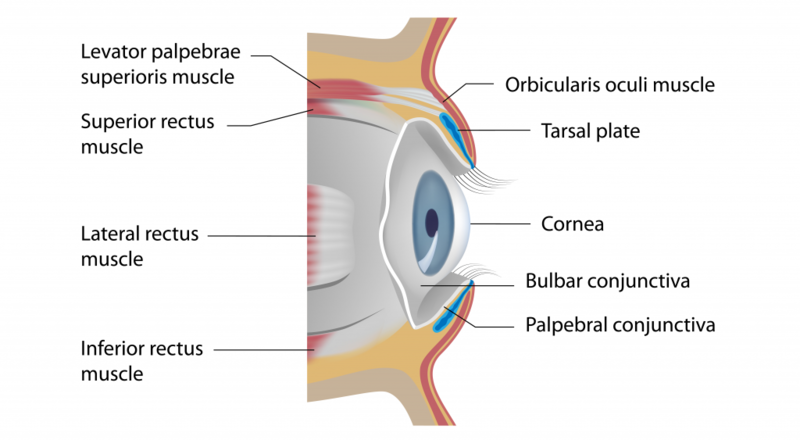 The orbicularis oculi muscle has three distinct parts – palpebral, lacrimal and orbital. Attachments – Originates from the medial orbital margin, the medial palpebral ligament, and the lacrimal bone. It then inserts into the skin around the margin of the orbit, and the superior and inferior tarsal plates. Palpebral part – gently closes the eyelids. Lacrimal part – involved in the drainage of tears. Orbital part – tightly closes the eyelids. Fig 2 – Sagittal section of the orbit, demonstrating the layers of the eyelid. The tarsal plates are located deep to the palpebral region of the orbicularis oculi muscle. There are two plates; the superior tarsus (upper eyelid) and inferior tarsus (lower eyelid). They act to form the scaffolding of the eyelid, and are composed of dense connective tissue. The superior tarsus also acts as the attachment site of the levator palpebrae superioris. In the tarsal plates lie the Meibomian glands (also known as tarsal glands). These are a specialised type of sebaceous gland that secretes an oily substance onto the eye to slow the evaporation of the eye’s tear film. The oily substance also prevents the eyelids from sticking together when closed. A stye (or hordeolum) is an infection of a hair follicle or Meibomian glands around the eyelash. If affecting the hair follicles, they are described as external, and if they affect the Meibomian glands they are classified as internal. Usually they are self-limiting, although they can sometimes be drained by removing the hair from the affected follicle. A chalazion is a painless granuloma of the Meibomian glands. It can be distinguished from a stye by the absence of pain in a chalazion, whereas styes are normally painful. 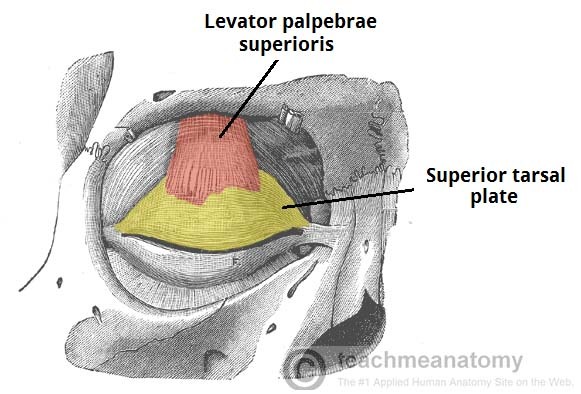 The levator palpebrae superioris and superior tarsal muscles both act to open the eyelid. They are only present in the upper eyelid. Originates from the lesser wing of sphenoid, and inserts into the upper eyelid and the superior tarsal plate. Originates from the underside of levator palpebrae superioris and inserts into the superior tarsal plate. Assists the levator palpebrae superioris in opening the eyelid. Superior branch of the oculomotor nerve (CN III). Sympathetic fibres from the superior cervical ganglion. Fig 3 – Attachment of the levator palpebrae superiors to the superior tarsal plate. The palpebral conjunctiva forms the deepest layer of the eyelid. It is a thin mucous membrane, which is reflected onto the sclera of the eyeball (bulbar conjunctiva). Ophthalmic artery – lacrimal, medial palpebral, supraorbital and supratrochlear arteries. Facial artery – angular branch. Superficial temporal artery – transverse facial artery branch. Venous drainage is provided by a rich network around the eyelid. Medially, blood drains via the medial palpebral vein into the angular and ophthalmic veins. Laterally, blood drains into the superficial temporal vein from the lateral palpebral vein. Ophthalmic nerve (V1) – upper eyelid. Supraorbital, supratrochlear, infratrochlear and lacrimal branches. Maxillary nerve (V2) – lower eyelid. As discussed above, innervation to the muscles of the eyelid is via the facial nerve (orbicularis oculi), oculomotor nerve (levator palpebrae superioris) and sympathetic fibres (superior tarsal muscle). The tarsal plate of the eyelid lies immediately deep to which muscle? Where in the eyelid do the Meibomian glands lie? Which of the following describes a chalazion?